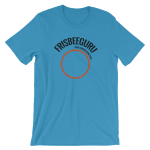 We heard your feedback and have added a Women’s Cut to the FrisbeeGuru T-Shirt line. Just like the Unisex Cut, these shirts are made from Jersey Knit cotton and are very soft. They are perfect for a lazy weekend day and even better for the jam. All proceeds go to support FrisbeeGuru’s mission. If you’re looking for other items, check out all our apparel here. « Poll: What is Your Favorite Color Discraft Sky-Styler?